The feedback form I had been using was most of the same questions included on the one that the SUP Guild provides for playtests. After having used it for a while, I realized a couple of things. 1) I was asking too much of my playtesters, and 2) I wasn’t using all the data that I was gathering. My games tend to be long; like in the 1 to 2 hour range. 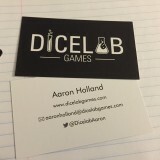 So not only was I asking that someone dedicate a lot of time to playing an unpublished prototype, I was then asking them to spend 5 to 10 minutes filling out the feedback form (if they decided to write much to begin with). What I found, was that most people aren’t nearly as invested as you hope that they are and don’t want to have to write detailed feedback. Every once in a blue moon, you’ll get someone who wants to go really in-depth and will give you a ton of feedback. That’s great, but those people are rare. I think that when I started using feedback forms, I was expecting players to want to give a lot of thought out and detailed feedback. I used questions that would help draw out their observations and opinions. On the rare occasions when players did take the time to write something, it was almost always something that was addressed in conversation and/or that I’m already planning to change. 99% of the best notes came from when I would just sit and observe the playtest and ask pointed questions during and after the game. For a while I stopped using the form completely because I knew it just wasn’t working how I had hoped it would. I’ve finally gotten around to re-writing it. The sheet has been condensed down from 2 pages to 1. All of the questions are a “rate from 1 to 5”, or “yes/no”. There’s still space for players to write in observations, but there are only 2 key questions; “What was your favorite thing about the game?”, and “what would you change about the game?”. The 1-5 and yes/no questions serve as a barometer for how players feel about your game, but the “favorite” and “change” questions are where the rubber hits the road. If you can find out what people feel is their favorite part of the game, you can spend time expanding on it, or even turn it into a focal point. If you know what isn’t working, you know exactly where you need to make changes. You may commonly find that players don’t like some of your “sacred cows”. These are your key mechanics and personal favorite parts of the game. Even if you feel that they’re too important to change, you need step back and try to understand why players are pointing them out as a problem. Another item that I removed from the form was a spot to sign up for my newsletter. I heard Jeremy Commandeur on the Legal Moves Podcast suggest not asking for player info so that they’re more likely to give honest feedback. After hearing someone say it out loud, it made a lot of sense to me, so I dropped it. Just be sure to have business cards or a separate sign-up sheet available. If the players liked what they played and are interested in keeping up with you, they’ll find a way to do it. Below is a link to the current version of my feedback form. 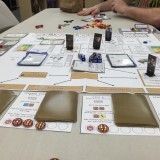 I used a combination of the SUP Guild and Unpub feedback form questions, with a tweak for what I’m most interested in knowing coming out of a playtest. 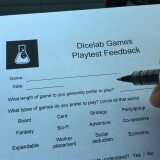 Are you using a feedback form during playtests? What information do you think is most critical to gather? I think the best thing you can include in a survey is a space at the bottom to add different questions that are significant to the game’s current iteration. Pro-level M:tG articles are a surprisingly good source of advice on playtesting. The best I’ve ever heard is that you should always have a reason to playtest. You should always approach a session with questions in mind, and actively seek the answers with your group. Broad spectrum questions are great for framework. With a trained eye, you can diagnose certain problems with a game. Satisfaction trends can serve as a valuable litmus test, and generate marketing data. Good points all around. I’ve always gotten the best feedback from direct questions and natural conversation.